It’s quite difficult to come up with something truly original these days. On one hand you have expectations from a market that forces developers to work within the confines of predefined genres. Is it action? Strategy? Action-RPG? Sim-MMO-Adventure-RPG-ish? If you don’t stick to those guidelines, you risk alienating publishers who don’t want to gamble and players who won’t know what to expect alike. Additionally, videogames have matured a lot and it feels like developers have more or less laid out all the possible forms of gaming, at least for a long term. Even the possibly most revolutionary game design of recent times – The Sims – has grown tired by now. Sure, you still have room for innovation but I’m not talking about creating portals in an already established FPS genre, but something truly, unmistakably different. A type of game that feels unlike anything else you have ever seen. Now THAT is very hard to achieve. So when something like King Of Dragon Pass comes along, by all means we must pause and ponder in awe its utterly fresh concept. 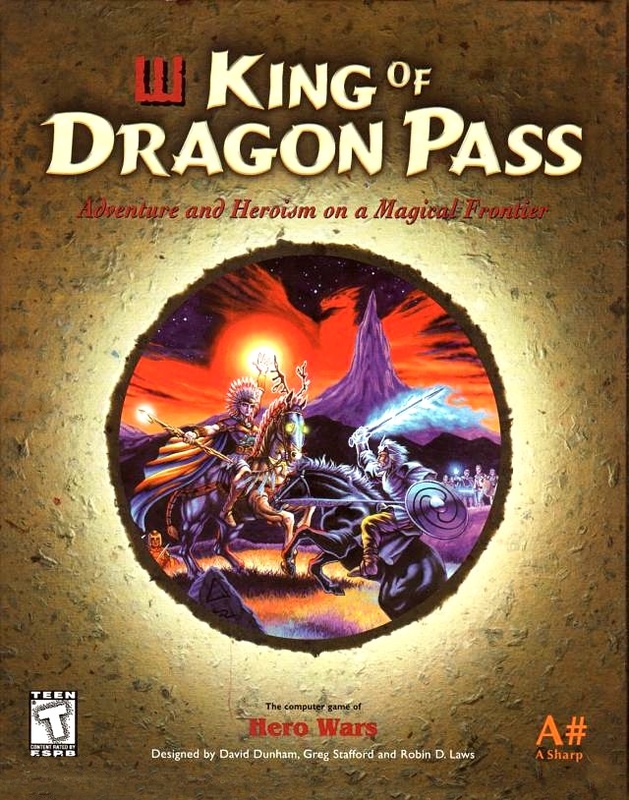 In all truth, King Of Dragon Pass was originally released in 1999 for Windows and Mac OS. While it was a proper commercial release through stores, there was little to no fanfare surrounding the game. For a decade it was left completely forgotten with barely any reviews and not much repercussion among gamers. Absolutely nobody followed in its steps. It would take a new platform and a port to give it a second chance and, luckily enough, a considerably better reception this time around. That platform is the iPhone and while a dedicated iPad version would make the ultimate port for a game like this, it’s very welcome to see the title finally achieving some popularity. The iOS port is extremely faithful to the original release with just a few cosmetic changes while retaining the design and content. It is a testament to its vision that the game remains just as unique and engaging a dozen years later. 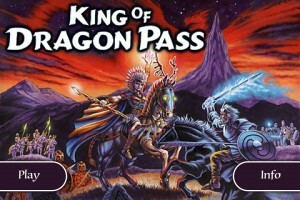 So, I can’t easily describe what it feels like to play King Of Dragon Pass. The game is set in the fictional world of Glorantha which was created by Greg Stafford, a man with quite a bit of pedigree as he’s not only the designer of a vast amount of role-playing games but founder of the venerable Chaosium Inc. company and also a shaman (no kidding). 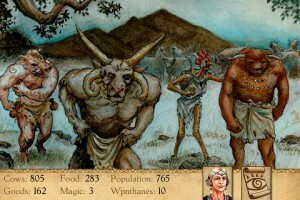 Aside from being featured in many board games, Glorantha was the setting for several books and this computer game, also co-designed by Stafford. 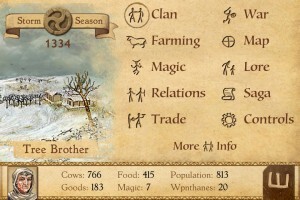 Basically, the game invites you to lead a barbarian clan through many generations in the wild lands of Dragon Pass. 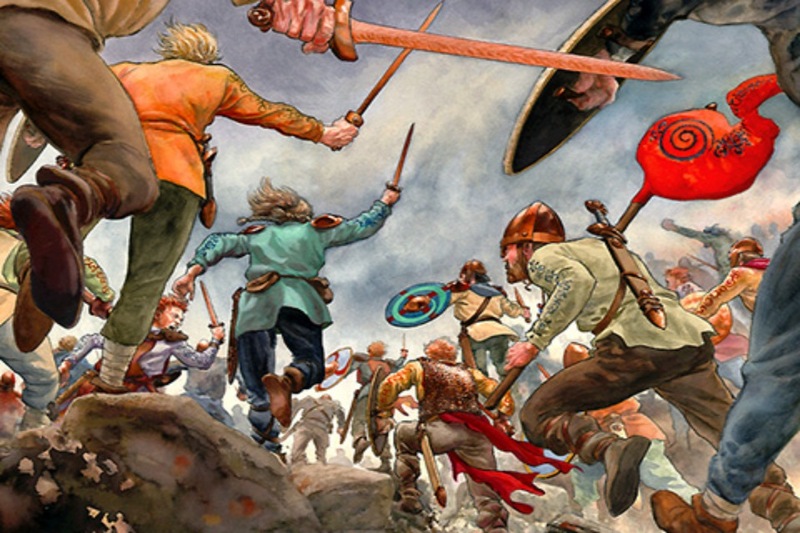 You begin as a very small and weak group of colonizers and over the course of decades you not only grow in number but gain the favors of deities, form alliances with other clans to make a tribe, and eventually become the King Of Dragon Pass. If you thought Civilization was epic, prepare to be floored. To survive in the dangerous wild lands, you need to train farmers and hunters to get food, crafters to manufacture goods and warriors to defend yourself or raid other clans. Trading and exploring your surroundings are also a must. 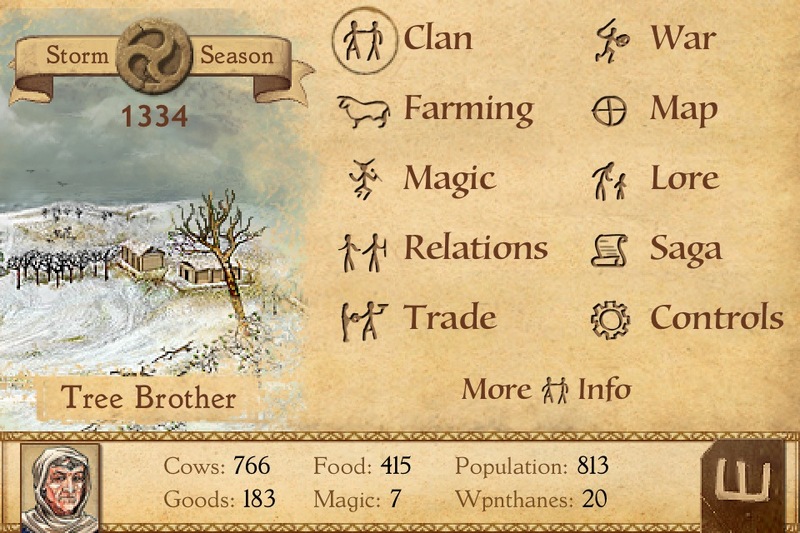 This is all achieved through turns: each year consists of five seasons which act as opportunities to manage your clan (for example, throw a feast to lighten up the mood or perform a sacrifice) or perhaps make important decisions such as proposing an alliance. Each season allows you to act twice, so an entire year can be quite eventful. You can always just sit lazily and let the seasons pass by but prepare to face the consequences if you disregard your clan. 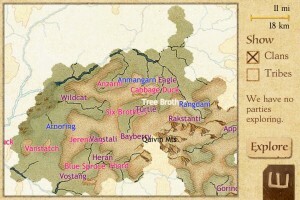 Occasionally, the strategic flow of the game is broken up as events occur that demand your attention: new visitors coming to your village, a potential threat luring in the distance, old favors that have to be repaid, and why not, quarrels among your very own villagers are just a few possibilities out of hundreds and hundreds. These scenes constitute the real gist of the game: they are elaborate and thrilling dilemmas in the spirit of Choose Your Own Adventure. The writing is superb, the situations themselves are very original, and the resolution is often fuzzy with consequences difficult to predict. What makes King Of Dragon Pass so great to play is the level of compromise it demands from you: far from relying on simple micro-management mechanics (or macro, depending on how you look at it), the game presents you with tough choices that may have deep implications in the future of your clan. For example, a long lost warrior that was assumed dead returns to the village but he’s cursed and has the looks of a fierce animal. Do you ban him? Maybe you want to seek revenge and attack the potential culprit of this outrageousness, but at the same time risk breaking an alliance… Or do you simply accept him back into the clan and alienate the rest of your villagers? There is no easy choice here, or at least no obvious one. As the game stresses often, there are no good or bad choices and you can’t depend on twentieth century morals (though behaving like Conan the Barbarian won’t do you any good either). Mild illustrative spoiler: if you accept back the warrior in the above example, then a few years later his child also turns out to be deformed, inspiring hatred and despair among your villagers. It’s good karma versus a civil war. Talk about implications! I’m sure you must be scratching your head and still wondering what it’s like to play this game, because I probably make it sound like it’s some sort of interactive tale. And yes, in some ways it is! Still clinging to those genre definitions? Think of it as a blend of lighthearted strategy and a Choose Your Own Adventure type of gameplay, along with mild RPG elements. But even that isn’t close to be accurate. 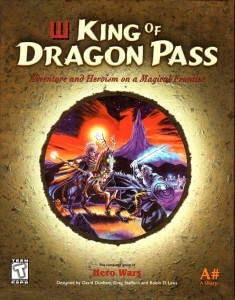 King Of Dragon Pass is like reading a book; more so, it’s like writing your very own legendary story. In fact, when you finish the game you have the option to review the entire story of your clan which can be dozens of pages long. 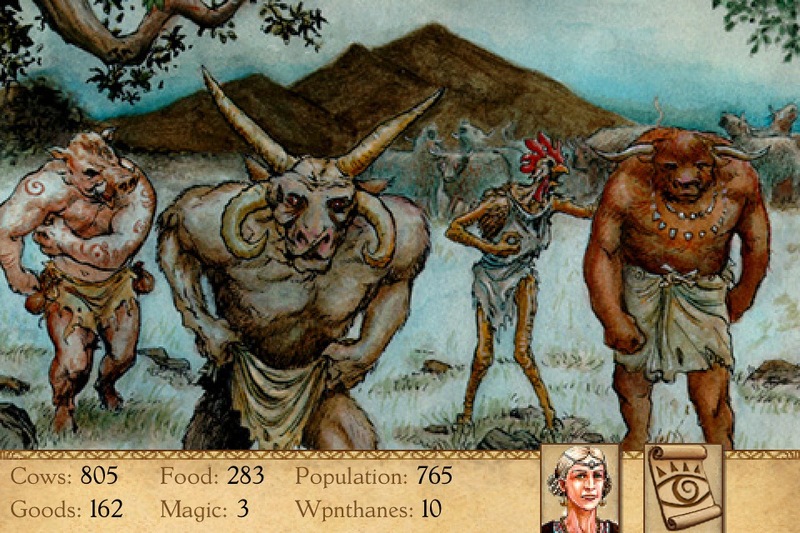 It’s truly fascinating to experience the progression from a puny bunch of villagers to a sprawling tribe. The emotional involvement is strong as you make critical choices that enrage your farmers or lose a battle and watch your warriors feel weak and pointless. 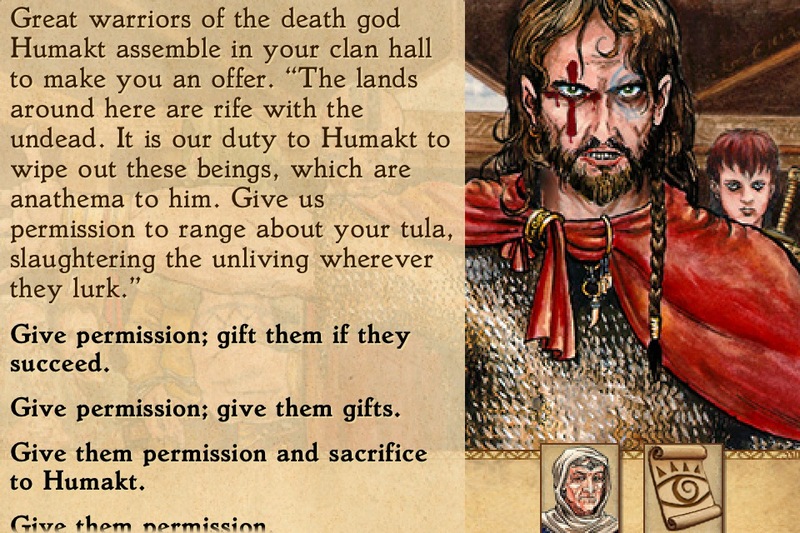 It always feels like there’s something happening in Glorantha and the rest of the clans are cunning with a well-defined personality. Needless to say, the first play can be extremely intimidating as you must strike that delicate balance between justice, mercy, aggression and passivity to succeed. Fortunately, the game provides several difficulty levels and two modes of gameplay: in the shorter one, you must become a tribe and last ten years as its king or queen. 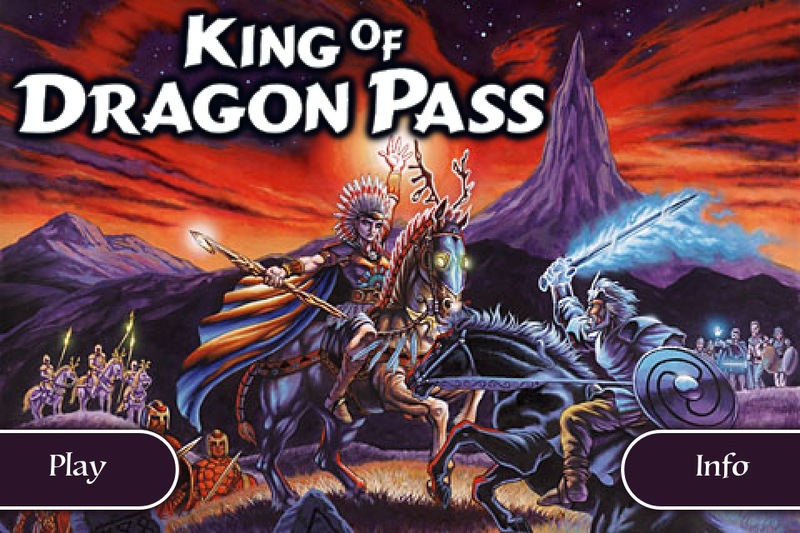 The longer gameplay session, however, demands that you become the king of whole Dragon Pass (which makes sense, after all it’s the title of the game) but this is no simple feast: it can take you centuries to become one. Combined with a deep and complex lore (sixteen ancient legends, fifteen distinct deities, a vast amount of history and culture), completely random playthroughs that never feel the same, allegedly over 500 hundred unique scenes, secrets that await you in the far reaches of the land, compelling writing, a soothing, appropriate music, and you have a real one-of-a-kind experience. 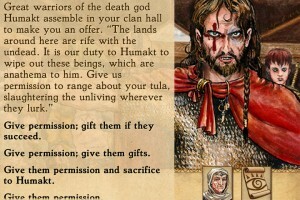 King Of Dragon Pass is one of the very few games that truly deserves to be called epic. If you enjoy reading, have an iOS-capable device and are in the mood for something different, then I must seriously encourage you to get this title. Yes, it’s ten bucks and quite steep for the App Store standards, but then again, very few games can promise you dozens of hours of addictive fun for ten bucks these days. Interesting…I don’t have an iPhone but I might be motivated enough by this. The closet I’ve ever played to this was the famed age of empires, and that seems like a joke compared to this. Thanks for the review! There’s no comparison. It’s not “pure” strategy but something else… If you enjoy adventures, then this is for you. You might have luck looking for the old retail version but I understand it’s rare. Plus, not sure what’s the compatibility status with newer systems. In any case, the game is an absolute must-play! Sounds absolutely impressive and I had never heard of it before, so, thanks dear Agustin. Any idea whether a PC version exists? I was lucky enough to pick up a copy of this game back in 1999. I forget what drew me to it because I had heard nothing about what it was about. Looking at the box though made me correlate to a kind of “choose your own adventure” with branching plotlines and all which I loved the idea of. Forgot to add that those interested in the Windows PC version can check out the Amazon.com marketplace where used copies seem to be selling in the $30-40 range. Thanks for the heads up! I will add the links to the article. I didn’t know you were also able to request the original game to the developer… If you ask me, I say the risk is worth it! This game is proof of how much the gaming industry has de-volved. The developer put so much heart in this product. I bought it on the Iphone and re-gifted it to two other Iphone and Ipad users. I hope to see more of these games, but sadly with the grip bigger companies have over video games these days, pushing for faster, bigger profits, it may never happen. I hope more gamers open their minds and realize what they are missing in exchange for shinier graphics. The major problem, I think, is the vast amount of reading involved. People simply don’t like to ready anymore these days, which is a real shame. No excuse now, this gem has just been added to the GOG library! This is super awesome! Thanks for the heads up! Thought you might like to know it’s just been released today on GOG.com as a PC game. I bought it and absolutely LOVE it (and I’ve never played it before). If you want to play it on widescreen so you can really enjoy the game, GOG now has it and for only $5.99. And no, I’m not affiliated with GOG Just looking for some blog posts about the game as I love it so much, and I stumbled on yours!! (Nice website design, btw).